Solvent-free, natural satin paint for wood and metal inside. Good drying and virtually odourless. Tested and certified ‘safe for toys’ and ‘saliva- and perspiration-proof’. 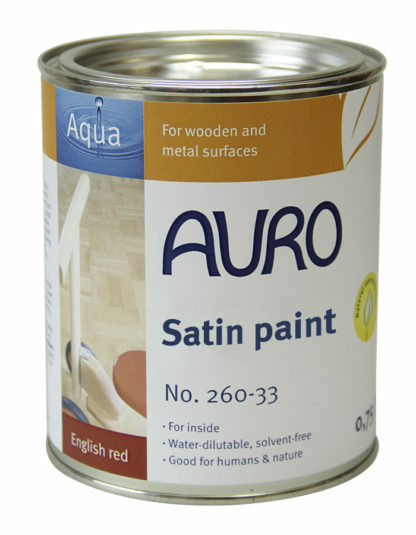 Pre-treat wood types rich in active substances with AURO Special primer No. 117, other wood types with AURO Hard primer No. 127. Prime wood types rich in active substances with AURO Special primer no. 117, other wood types with AURO Hard primer no. 127. Then apply at least two paint coats. Stir well, do not apply too thick. The satin mat paint is suited for interior coatings only. The colour tones of the paint can be freely mixed among each other. See our colour chart for numerous colour tone examples.